How Will The New Tax Law Affect Alimony? As republican members of Congress celebrate passing a sweeping tax overhaul, many Americans are wondering how the new law will affect their tax bill in 2018. Congress eliminated many deductions that taxpayers have come to rely on, including the alimony deduction. For couples currently negotiating a divorce settlement or a prenuptial agreement, the new tax law will have a major impact. One provision in the new tax law removed the 75-year-old tax deduction for alimony payments. As the law currently stands, paying spouses are able to deduct the amount of alimony payments from their annual federal taxes. Receiving spouses then pay income taxes on the payment they receive. After December 31, 2018, paying spouses will no longer be able to claim this tax deduction, and receiving spouses will be relieved of paying income taxes for alimony payments. The elimination of the alimony tax deduction will potentially affect hundreds of thousands of families. According to the most recent IRS data, more than 600,000 Americans claimed an alimony tax deduction on their 2015 tax returns, totaling nearly $12.3 billion. Ninety-eight percent of alimony recipients were women. Many tax experts are concerned that the change will adversely affect divorced couples. In Florida, for example, a spouse receiving alimony payments must earn a lower income than the paying spouse. Typically, receiving spouses are in a lower tax bracket than paying spouses, allowing divorced couples to keep more money within the family unit. “Imagine high-earning Spouse A now pays and deducts $30,000 a year in alimony. Spouse A’s income is federally taxed at 33 percent, so the deduction saves him $9,900. Why Did Congress Eliminate The Alimony Deduction? The alimony deduction preserves more money, helping divorced couples afford living expenses after a divorce. So, why did Congress get rid of the deduction? The House Ways and Means Committee called the alimony deduction a “divorce subsidy,” considering that divorced couples get taxed at a better rate than married couples. 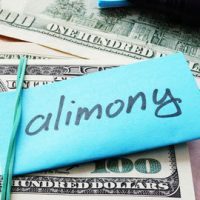 The panel argued that alimony payments should be treated like child support, which is not tax deductible for the paying spouse or for the receiving spouse. The congressional Joint Committee on Taxation estimates that repealing the alimony deduction will add $6.9 billion in new tax revenue over 10 years. The new tax law will only affect couples who divorce after December 31, 2018. Couples that divorce and enter into alimony arrangements prior to that date will still be allowed to claim the deduction. If you have questions about how the new tax law could affect alimony payments, you can contact our family law attorneys at Arwani Law Firm ,. We have handled complicated high conflict divorces, and we are confident that our team can provide you with the legal assistance and attention that your case requires.